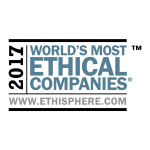 World’s Most Ethical Companies® honorees. the underpinnings to the decisions they make each day. positive change in society,” expressed Singtel Group CEO, Ms.
Companies can be found at http://worldsmostethicalcompanies.ethisphere.com/honorees/. practices in ethics with the publication of Ethisphere Magazine.